This Light Bluish Grey [BL] / Medium Stone Grey [TLG] element comes in 70009 Worriz' Combat Lair , and the Chima theme also provides Dark Brown versions in 70008 Gorzan's Gorilla Striker and 70014 The Croc Swamp Hideout . NCS fans can doubly rejoice as it will also come in Blue [BL] / Bright Blue [TLG] in 70404 King's Castle . Its most striking feature is the triangular facet which is a perfect equilateral, or as perfect as I could measure with a standard ruler. This surprises me a lot, given the 5:6 ratio of LEGO bricks and the difficulty in matching diagonals when using them. Taking the triangle one step further, I created this neat sub-model with SNOT and some 1X1 plates to fill gaps at the rear. 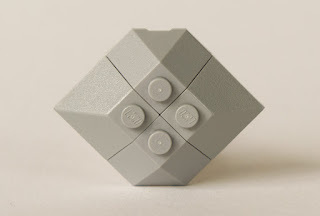 Once I have 24 of this element I’ll attempt to make a rhombicuboctahedron! This simple combination highlights the beauty of this facet. With Brick 2X2 W. Angle 45 Degrees below it and Corner Brick 2X2/45° Outside above, we will have a way to cap the corner facet and taper to a single point at the top. 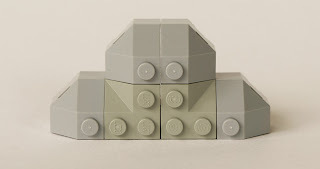 Combining it just with Corner Brick 2X2/45° Outside creates another pleasing shape which will tessellate, which would make a cool SNOT wall for a sci-fi MOC. There are plenty of other interesting combinations with different 45° slopes. My apologies for mixing old grey in this pic! Surely I own these in bley...somewhere...? Note the similarity with Roof Tile 4X2 W. Angl./Sl.Bot, the key difference being that part has an irritating gap of 1 plate along the long edge, destroying the symmetry and of course that equilateral triangle. And finally here is a quick tablescrap for a church window, utilising the beauty of the underside of this piece. I hope these suggested techniques whet your whistle for using this new part. Cool! I never knew that a piece like that could have so many uses. Not that I have any, anyways. :P But still, nice website! Good job! Just curious, but how do you get your hands on parts like this? 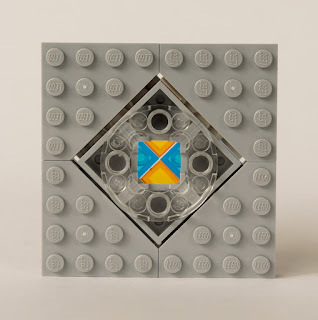 For example, i tried looking for the trans-clear 6x6 round plates that you use as a base for your "stained glass" MOC at the end of this post, but can't find it listed. At least not as part of a set... 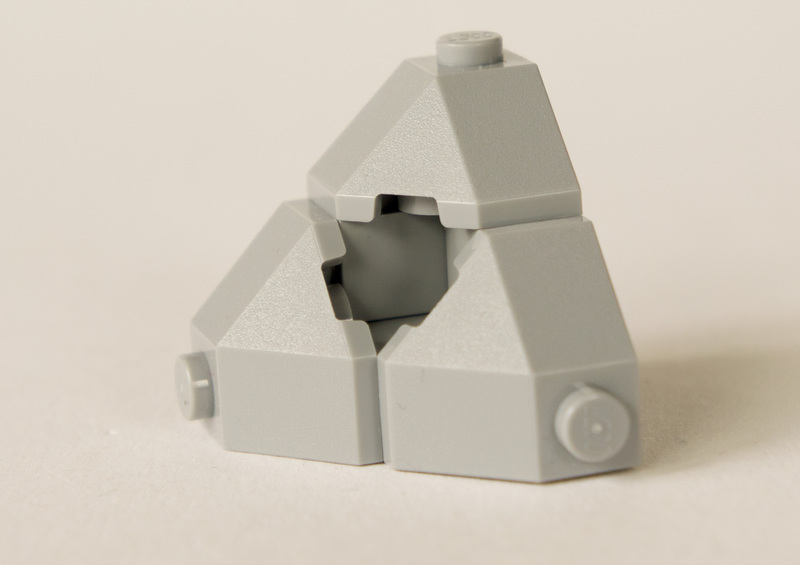 I haven't tried making an MOC yet, but i've considered it, so i would expect to find not-set parts available in pick-a-brick? 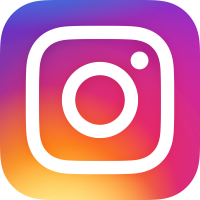 *edit: i meant 4x4 round plate, not 6x6. Site i searched was BrickLink, which i frequent for inventories before i buy a set, and also to check set inventories from sets i got as a kid. That's a really neat and useful piece.